Bold and beautiful, simple with a Rustic feel, our Redmond Wellington Armoire is a shining example of high quality, Amish made furniture. Bench-built from the finest, hand-selected hardwood, finished with a quality stain and post-catalyst conversion varnish, this piece is made to be passed down and treasured as a family heirloom. 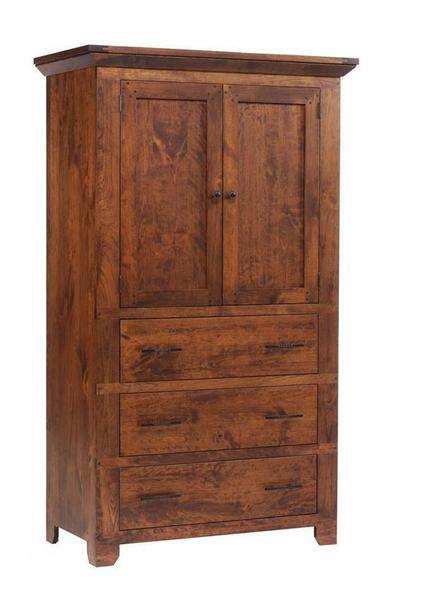 As a versatile piece of your bedroom storage, this armoire offers a large, two door cabinet that can be used to house folded clothes, or hanging clothes with our optional clothes rod. Add the pocket doors, TV swivel and VCR shelf and your new armoire can serve as your bedroom entertainment center and keep your television concealed when not in use. Below this cabinet, sits three full-extension drawers that open with the smooth glide of ball-bearing slides and serve as a testament to the true quality of this piece. Perfect for storing your clothes and linens, with the optional cedar drawer bottoms and soft-close slides, your armoire will serve as an elegant extension of your bedroom storage. Questions? Please call one of our Amish Furniture Specialists today to help. We offer stain samples for all of our furniture, so you can be sure to get just the right piece for your bedroom decor.